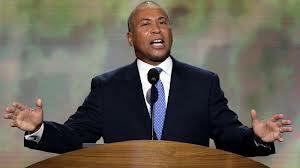 Governor Deval Patrick has always been a great campaigner. (Remember how he dramatically he came to life to run successfully for a second term against popular and accomplished Republican candidate Charlie Baker?) Last night’s speech to the Democratic National Convention showed Patrick in his very best campaign mode. His role was to remind Americans that Mitt Romney’s record in Massachusetts (except for his singular and GOP-denied accomplishment of RomneyCare) was a negative one. “Mitt Romney,” said Patrick, “talks a lot about all the things he fixed.” meaningful pause. “I can tell you Massachusetts was not one of them.” Patrick then enumerated. The Democrats typically say Romney’s record on job creation put it 47th among states, an average of Romney’s four years. Some fact checkers note the state started at 50th and ended up at 28th by the time Romney left office. (Fact checkers are all over the map on this issue.) Patrick talked about incomes eroding under Romney though evidence suggests incomes were stagnating. Patrick’s analysis was not by any means the “pants on fire” level of Paul Ryan’s speech, but the figures were selectively presented to reinforce a point of view. None of the Democrats notes that Romney did close a $2 billion budget gap, albeit with hefty fee increases, which the Republicans never mention. Patrick didn’t dwell on the negatives of the Romney administration but cited Barack Obama’s accomplishments and exhorted Democrats to remember the details of the President’s record and stand up for them, and for the party’s shared values. Because they share governing philosophy (“We believe that government has a role to play, not in solving every problem in everybody’s life, but in helping people help themselves to the American Dream.”), Patrick’s embrace of Obama’s approach has the effect of validating his own. What stood out about the Governor’s speech was his feistiness. Reminding listeners of Republican obstructionism, he pledged he would not stand by and let him (Obama) be bullied out of office. And neither,” he said, should they. The Governor built his momentum artfully, rousing the audience, intensifying his own passion, and left many, I’m sure, wondering if this is a prelude to a Deval Patrick run for President in 2016. He says he has no plans, but only the most naive would not take that protestation with a grain of salt. He certainly has more of a record on which to stand than Barack Obama did when he ran for President in 2008. And, in campaigning for the President across the country, Patrick has been strengthening his own national network. The Governor could run whether Obama wins or loses, unless, in the latter case, there is a strong Republican incumbent to take on. Patrick is as credible as any of the other up-and-comers in the Democratic Party. But there will be a lot of them, including the remarkable San Antonio Mayor Julian Castro, who, however, may have his eyes first on the long-shot Texas Governor’s office, and Maryland Governor Martin O’Malley. Plus, Hillary Clinton could decide to run. This is all highly speculative of course in the context of the 2012 election, just 60 days away. This entry was posted in Politics and tagged Deval Patrick, Deval Patrick convention speech, Mitt Romney's MA record, Obama reelection bid, President Obama. Bookmark the permalink.